Hey Everyone, I'm Sailor Moon! Hey everyone, my name is Serena Tsukino (or Usagi Tsukino in Japanese). Some stuff about me: I love romance, food, comic books, my friends and especially my soul mate Darien. Some things I don't like: school, my annoying little brother, sports and waking up early. I'm clumsy, I'm kind of a crybaby and I tend to sleep in a lot. Guess what? 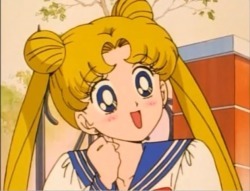 I've got a secret; alongside with being Serena, I'm the mega-awesome heroine Sailor Moon! On behalf of the moon, it is my sworn duty to fight in the name of love and justice. Click here for the School Uniform Gallery. Click here for the Moon Kingdom Gallery.